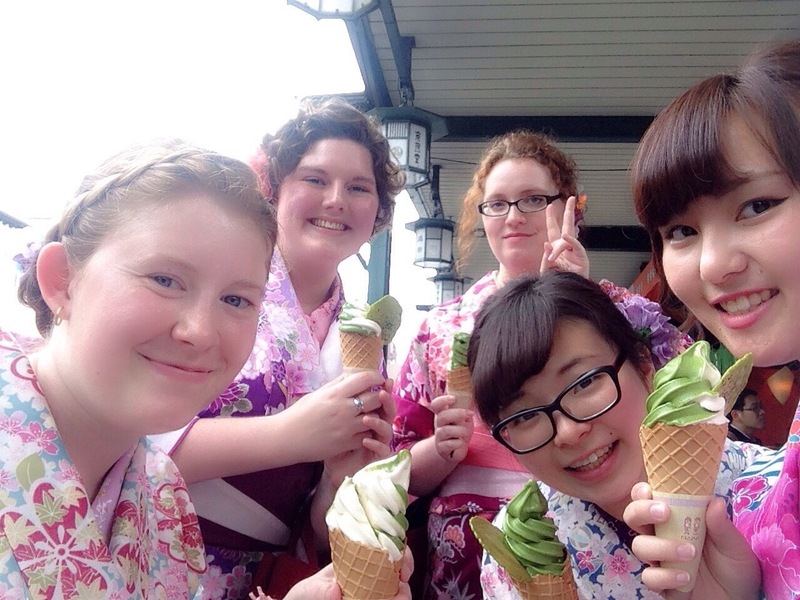 A few weekends ago, I had the opportunity to wear kimono in Kyoto with a few of my friends! The experience was lots of fun (as expected), but also very challenging (in unexpected ways). You’ll see why below. We stepped back onto the main street of Gion feeling gorgeous; apparently we were because a few of the people who first saw us literally stopped, mouths open, to stare at us as we walked by. Some said “かわいい” (pretty), while others said “very beautiful” in thick accents. We made our way to Yasuka Jinja, made it up the front stairs and through the gate, when I turn around and see a guy asking Candice to take a picture with him. We all rush over, five girls wearing kimono, and suddenly there’s a mob in front of us, fighting to be the next one to pose with us. We later realized they were Chinese tourists, and by the end of the day we were taking back roads and roundabout ways to try and avoid them. When there was finally a gap in people trying to take our picture, we walked around the shrine a little, got our fortunes （おみくじ — omikuji）, and looked at the kimonos of other girls walking around. There are always lots of people in kimono in Gion, but it’s more fun to look at them when you’re wearing one too. In some people you see a kind of acknowledgement in their eyes: “hey, you’re wearing a kimono? I’m wearing one too! *both bow slightly. * In others, like one girl who happened to be wearing the same kimono as me, there is no acknowledgement but instead a frosty denial of existence. I could tell she was trying her hardest not to make eye contact with me, even though her friends readily did and we were in the same store for probably 5-10 minutes. One of the most interesting moments (and we kind of set ourselves up for it) was when we decided to get ice cream. Ice cream + kimono + walking = disaster, and you aren’t really supposed to eat and walk at the same time in Japan anyway, so we stood in a huddle near the ice cream place on the main street. Everyone stared at us. I thought I got stared at before; this was a totally different experience. It was like we were famous or something. We could always spot a tour group coming (they were ALL Chinese), from the sheer amount of people all traveling in one pack, the huge cameras, and the stares they gave us from all the way down the street which only grew as they came closer. The closer they got, the more awkward and sneaky they tried to be about taking the pictures until it really wasn’t sneaky anymore. Then, predictably, someone would approach us, and we would turn around for a picture, ice cream in hand; and, unsurprisingly, 20 more cameras would suddenly appear and people would be throwing their arms around us or shoving into the middle of our group one after the other. After about the first two people took pictures with us the rest of the group would cease to ask if it was okay if they threw an arm over our shoulders or stood much too close for comfort. It was as if we stopped being people and had changed into some sort of of cool cardboard cutout thing that everyone wants to take pictures with. No one asks a cutout if it’s okay to pose with it or if it’s busy; they just do. On the whole they were nice enough, just a little impolite. Eventually we grew tired of taking pictures with hordes of Chinese tourists and opted to walk down a busy side street. We started walking, shutters clicking behind us, and the pictures stopped. 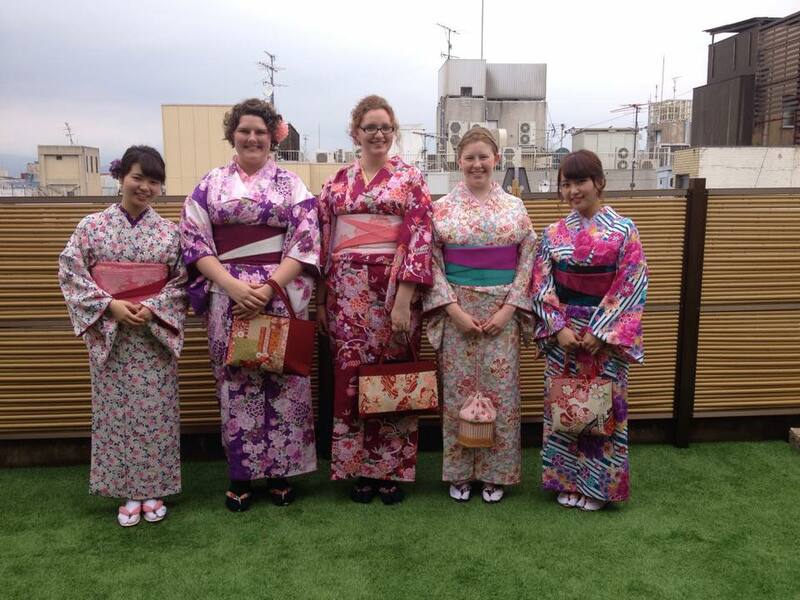 Or at least the let’s-get-a-photo-with-the-gaijin-in-kimonos stopped. People still took them from across the street, but at least they weren’t clamoring over each other for one. We walked down the street to the Kenninji where we took lots of photos of each other under the trees and in front of the shrine buildings. 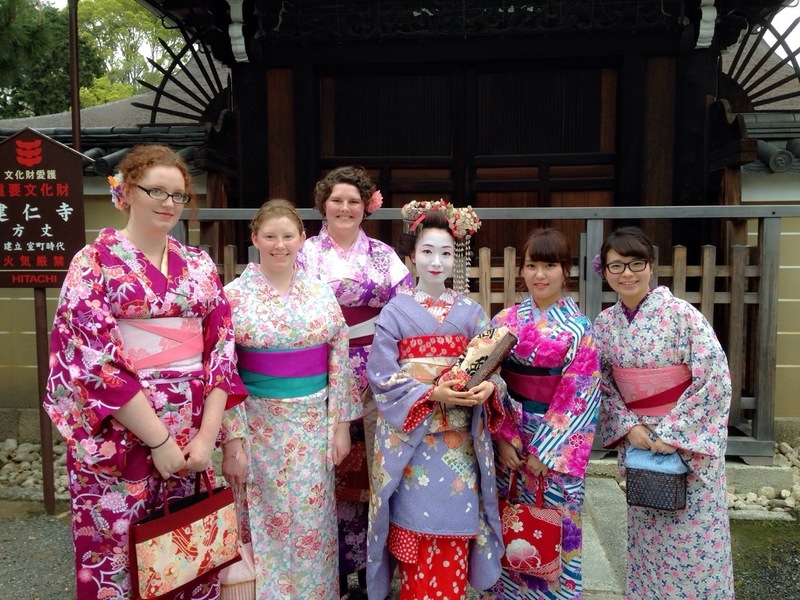 While we were there, we got a photo taken with someone dressed up as a Maiko (an apprentice Geisha)! We couldn’t tell if she was the real thing; there are places you can go to be a “Maiko for a day,” meaning you get a wig, makeup, and a fancy kimono and can walk around Gion. Even if she was just someone masquerading as a Maiko, it was still really cool. The kimono was gorgeous! By the time we had to return the kimono we were all tired, hot, and aching from the zori (a type of shoe worn with kimono). It’s not very difficult to walk in kimono or with the zori; they’re just like flip flops. 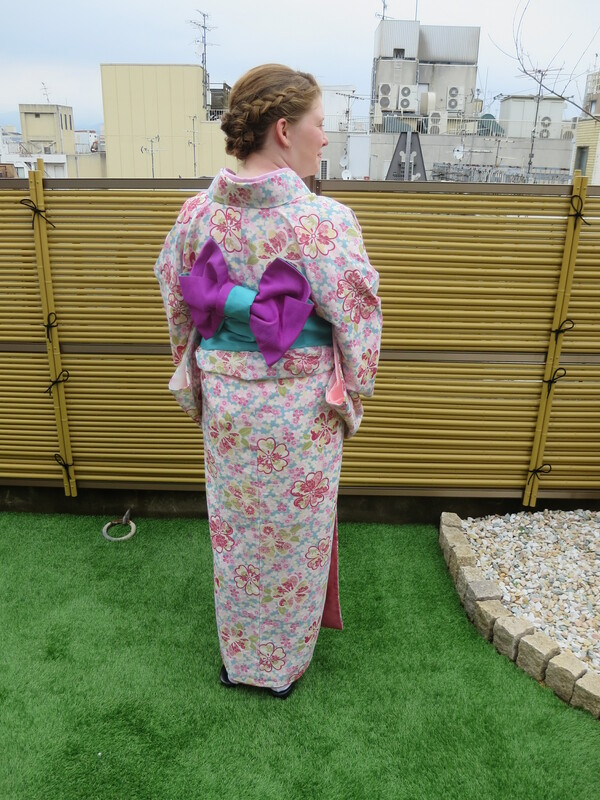 However, the kimono does make it so you have to take small steps and the zori don’t have padding or anything for your foot, so it does get tiring after a while. It felt amazing to put my normal clothes back on and put my feet into my sneakers! Maybe the weirdest thing after having dodged tourists all day and having people gawk at us was walking down the same street in normal clothes. It was refreshing, but also strange. An hour ago we were famous; now we’re just a part of the crowd. I will never forget that experience, and I will always cherish the photos we took that day!